Replacement refs: They're the world's worst substitute teachers. Replacement refs: They’re the world’s worst substitute teachers. The replacement refs are the world’s worst substitute teachers. 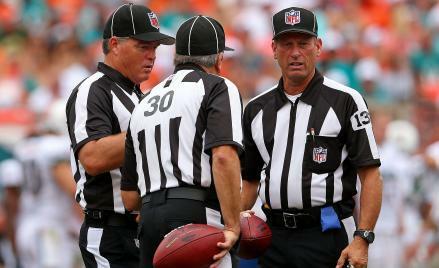 NFL replacement referees discuss a play during a game between the Miami Dolphins and the Oakland Raiders. Photo by Mike Ehrmann/Getty Images. Before the season started, we thought the replacement refs would botch a lot of calls. We were right. What we didn’t realize is that ignorance would be the least of the scabs’ problems. NFL refs serve two functions: They administer the rules, and they keep the game running smoothly. It’s in that second category where the replacements’ incompetence does the most damage. Roger Goodell’s Div. III call-ups are substitute teachers, filling in while the real on-field authorities are on an unpaid vacation. When a substitute shows up, spitballs inevitably start flying. It doesn’t matter if you know the lesson plan and you’ve memorized the demerit system. If you can’t convincingly play the role of the no-guff-taking man in charge, the specific rules are meaningless. And if there’s one thing the replacement refs really can’t do, it’s make anyone believe they know what they’re doing. “Honestly. It’s embarrassing. The command and control of this game is gone,” ESPN’s Mike Tirico said during Monday night’s Falcons-Broncos game. The biggest embarrassment came at the end of the first quarter, when the replacements took six minutes to resolve a fumble, eventually awarding possession to Atlanta even though a Denver player came out with the ball. As Mark Schultz of FootballZebras.com explains, “The second, more egregious breakdown happened when an official didn’t orbit the pile watching out for trouble.” A fight broke out, and the Falcons’ Ray Edwards ended up bumping one of the refs. Edwards was given a 15-yard penalty, but he was not ejected. “The replacement officials looked confused, unsure, and after that incident, it appeared they did not have credibility with either team,” Schultz writes. The incompetents in striped shirts are creating a vicious cycle. Their skittishness both encourages players to break the rules—“The next time an official calls illegal contact after 5 yards will be the first,” an unnamed player told ESPN.com’s Ashley Fox—and makes them hesitate to call out guys for their rulebreaking. Referees modulate the level of hostility on the field. They control how coaches behave. They make sure the clock runs and the chains move. They represent a thin layer of necessary bureaucracy that keeps the game from tipping over into anarchy, and what authority they possess is conferred upon them by things like tenure and institutional memory and familiarity with the players and coaches. What the scabs lack in that regard, they more than make up for in weakness and doubt and fear. The game gets uglier and slower as a result. The importance of skill diminishes. The outcomes are more whimsical. Even though they can now get away with murder (or at least illegal contact), the players aren’t happy. “The NFL and everybody always talk about the integrity of the game. I think this is kind of along those lines,” Ravens quarterback Joe Flacco said after Baltimore’s one-point loss on Sunday. The players don’t want games decided on the basis of who can best take advantage of the hapless substitutes. They want rules. They crave structure. And the most paternalistic commissioner in pro sports won’t give it to them.